Buyers in the India static synchronous compensator (STATCOM) UPS market are giving brand image exceptional importance, prompting companies to differentiate both their offerings and brand value, finds TMR in a new study. This sentiment has percolated to building customer loyalties that are driving STATCOM UPS suppliers in India, thereby pushing players to focus on their branding building. Keeping in line with this trend, while companies such as Bharat Heavy Electricals Limited (BHEL) are focusing on increasing their vendor base to improve competitiveness, others such as ABB India Limited are focusing on product management. The leading players will also have to focus on improving their manufacturing facilities and increasing their research and development investments to gain a stronger footing in the Indian market, TMR recommends. A TMR analyst reported, “The economic liberalization of India since 1991 has put the country in a race to achieve better GDPs, improve employment rate, and create an independent success story.” Over time, these reforms have accelerated manufacturing activities in the country and set in a noteworthy momentum to industrialization, thereby creating a huge demand for energy. The need for several companies spread across India to achieve a reliable and an uninterrupted source of energy has been the primary growth driver for the STATCOM UPS market. 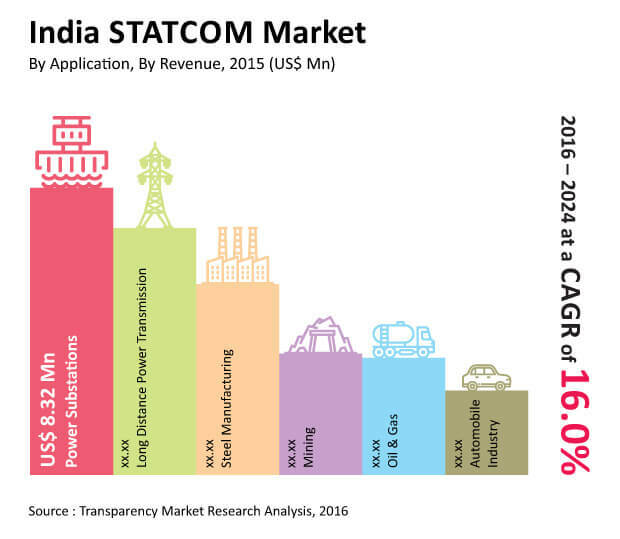 The STATCOM UPS market is anticipated expand as growing number of flexible AC transmission systems (FACTS) projects are underway in Andhra Pradesh, Gujarat, and Karnataka. The biggest restraint in the India STATCOM UPS market is the poor awareness of its benefits amongst industries. This issue can be attributed to the infancy of the STATCOM UPS market and the small and medium-sized companies that do not have the knowledge about the benefits these systems can provide over conventional technologies. These restraints are also being complicated by the high costs of installations that are dissuading large scale manufacturers from adopting these UPS systems. As the policies on foreign direct investments (FDI) are being relaxed, India is expected to witness a boom in the manufacturing sector in the forecast period. STATCOM UPS players have taken a cue from this recent development o keep up with the mammoth energy demand to cater to the ambitions of the manufacturing hubs spread across India. Therefore, the growth in manufacturing activities of India will lead to a profitable opportunity for STATCOM UPS market in the near future. TMR findings indicate that opportunity of the STATCOM UPS market in India will be worth US$113.9 mn by 2024 from US$27 mn in 2014, surging at a CAGR of 16.0% from 2016 to 2024. This growth will be attributable as the evolution of India evolves as an important manufacturing hub in the world. For instance, the automobile industry, a significant application segment of the overall market, will expand at a 15.9% CAGR all through 2024. The need to speed up automobile production to cater to the global demand will encourage the adoption of STATCOM UPS in Indian automobile market. The aforementioned analysis has been substantiated with the research report published by Transparency Market Research. The document titled, “STATCOM UPS Market - India Industry Analysis, Size, Share, Growth Trends, and Forecast 2016 – 2024,” provides a detailed outlook of the market and its impact on the Indian economy.